This upright form of the common beech was selected at Dawyck Botanic Gardens in Scotland for its stunning yellow to lime green foliage. Throughout the summer the startling, bright leaves turn slowly to mid-green and then bronze and yellow in the autumn. The Golden Fastigiate, as it is more commonly known, is an ideal variety for brightening up a dark corner, as it has a minimal spread of 10 x 3 metres in 20 years, spreading more in maturity. ‘Dawyck Gold’ will tolerate an exposed position but avoid wet soils. Ideal as a single specimen or for avenue plantings. For a purple leaved form see Fagus sylvatica ‘Dawyck Purple or view all Beech. 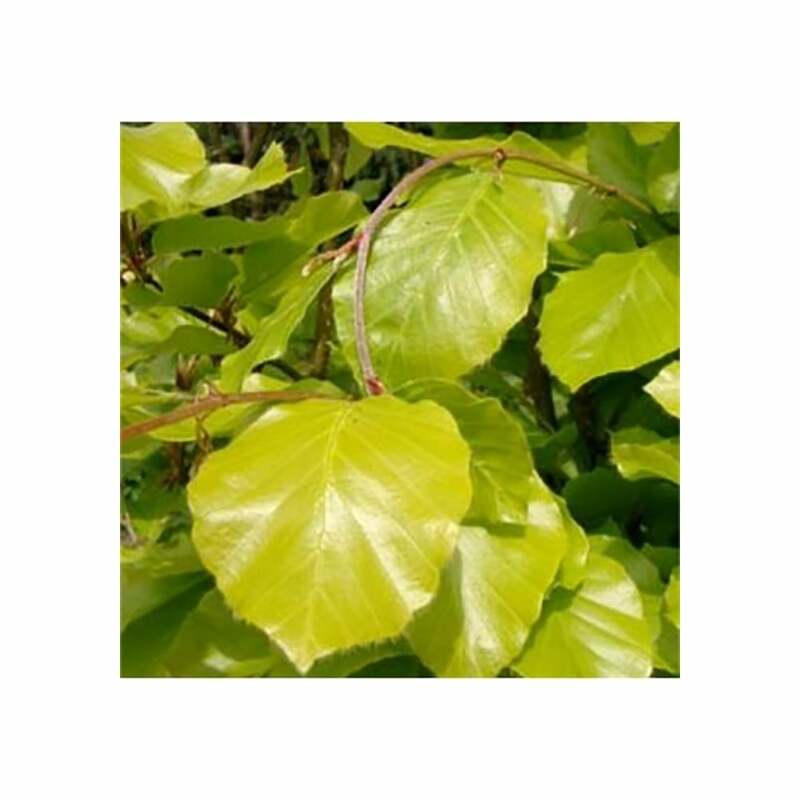 When planting beech trees, such as Fagus SylvaticaDawyck Gold, it is important to prepare the planting area well. Pot grown beech trees can be planted at any time of the year. You will need to carry out the following to prepare your planting site. Firstly, remove all weeds and grass within a metre of your desired planting hole then dig a hole as deep as your root mass and approximately 2x as wide. We recommend digging a square hole as this encourages the roots to grow straight as opposed to around inside the hole. To help your tree establish more effectively, we advise applying root grow (sprinkle in the hole for pot grown trees), especially if you have poor soil. Gently loosen the roots and place into the planting hole. Using 50% of the original soil and 50% compost, fill in the hole and firm around gently. Make sure not to bank the soil up around the collar of the tree as this can cause problems. To see how to use a tree stake and tie, watch our informational how to videos. If you’re planting in dry weather, water well and regularly for the first few months. The same goes for spring and summer planting. Make sure to keep an eye on your young tree and increase watering if there are extended periods of hot or dry weather. If you’re planting in autumn, you may only need to water your tree a little. Beech trees have shallow roots so applying a mulch will help to lock in moisture. We also stock a range of irrigation kits, suitable for a variety of planting schemes. Similarly to many of our ornamental trees, beech trees do not require a lot of pruning. Remove any damaged or diseased branches when the tree is in leaf or just after leaf fall. This will prevent bleeding, which although it is not detrimental, can look unsightly. When pruning, make sure to maintain an even framework, step back and assess your work and prune proportionately.